Happy Friday everybody! 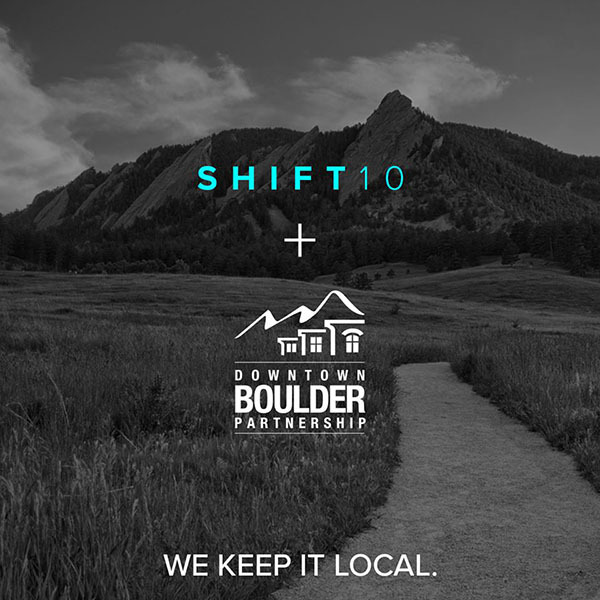 This upcoming week is a big one for Downtown Boulder because Tuesday October 10th is SHIFT10 Day! SHIFT10 is a national movement that encourages shoppers to shift 10% of their regular spending to small, local businesses. Growing up in Boulder, I have been surrounded by local businesses (over 80% in downtown Boulder are locally owned!). I also work at two locally owned businesses here in Boulder, and love the local feel! With events such as the Boulder County Farmers Markets, and the plethora of shops and restaurants, Boulder makes living locally easy. One of my favorite local restaurants, Arcana, is offering 10% off your bill on SHIFT10 Day. Another favorite of mine is The Cup, which sources from a local roaster and provides only fair-trade coffee. Stop by The Cup for 10% off your purchase on SHIFT10 Day. All you have to do is stop by the Visitor Information Center, take the pledge, and pick up a sticker showing your support. The SHIFT10 pledge states that you will shift 10% of your spending to locally-owned businesses, which makes a difference in your community. Local businesses are part of what makes Boulder beautiful, and here at Downtown Boulder we strive to support these businesses. On SHIFT10 Day we will also be debuting MyBoulder Itineraries, which spotlight local businesses and their favorite downtown Boulder locations. Tune in to Facebook and Twitter as we highlight one business a day through the holiday season! On Tuesday, October 10th, stop by the Downtown Visitor Information Center to make the pledge (starting at 10 a.m.) and receive a pledge sticker good for special savings opportunities throughout the day at participating businesses! (You must have a sticker to enjoy these exclusive offers.) See list of offers here. Learn more about the national movement at www.shift10day.com. Keep Boulder small, and love the local!